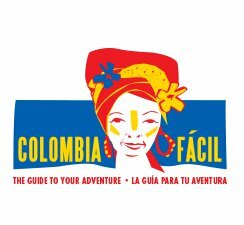 Colombia Facil is a handy little pocket guidebook with useful tips, discounts and information for all over Colombia. You can pick up a copy in hostels and tourist offices for a measly 3,000 pesos. The online website is also super informative.. with travel stories, tips and cultural insights, accommodation and reviews. 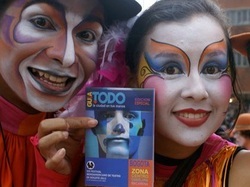 Be sure to check out the FAQ section before planning your trip to Colombia to make everything a lot more, well, easy. Que Desparche! A Latin phrase that roughly translates as "Fiddlesticks! It's Saturday night and I have absolutely nothing to do". If you find yourself in Cartagena AND you can speak Spanish, this website is pretty handy at letting you know about the big things happening around town (especially cultural events and exhibitions). 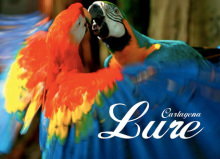 Lure is a very goodlooking, super-high gsm-ed bi-lingual printed guide to Cartagena, pitched more towards the luxury end of the market. If you're already in Cartagena and your hotel has a copy, be sure to snaffle one up! Although Lure focuses on being a physical hold-in-your-hands guide to the city, a lot of the information (and the very pretty pictures) have been reproduced on this website and it is a great starting point to learn a little more about the city. I feel as though it may be completely redundant to explain what couchsurfing is, since it seems as though the entire world uses it and loves it. Just in case: couchsurfing is about making the world a little smaller and a little friendlier. Locals open up their homes and lives to travellers who share their world and their experiences in it. Sometimes it's about sharing a couch, or a meal, or a drink, or an activity or advice. The Cartagena community of couchsurfers is fairly active in terms of meet ups, although finding someone to host you for the night might be difficult. One of the best things you will read about living and loving Colombia! BananaSkinFlipFlops recently won BEST LATIN AMERICAN WEBLOG (so it must be good) and the 101 Reasons to Love Bogota post is breaking records with visitors and admirers. Although the majority of the posts reflect on life in Bogota, the capital city where the blog is based, Vicki also enjoyed a brief summer love affair with Cartagena and found just as many reasons (Yes, 101) to love this coastal town, too. In summary, a wonderfully written blog written by a wonderfully witty, curious and empathetic ex-pat. If you are considering visiting or living in Latin America, add this one to your follow list now. 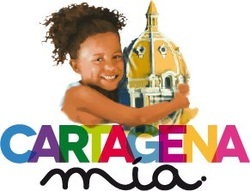 A website for those of you who live in Cartagena (or have friends who do), Cartagena Mia is an initiative of Cartagena de Indias Turismo to promote the restaurants, hotels, activities of the city to its residents by way of weekly discounts and promotions. To access the deals all you need to do is bring in a copy of your electricity bill to the participating businesses. It's difficult to go anywhere in Cartagena without spying one of these handy free city maps - you'll find them in every eatery, salon, tourist office, hotel, fashion boutique and bar. Be sure to pocket one when you do. The map highlights all the key tourist destinations in a really clear format and the accompanying adverts are a great way to help plan your stay. Especially useful is the online component. Even though it is in Spanish.. a quick page translate will unlock a useful guide to things to do in Cartagena. Check it out. 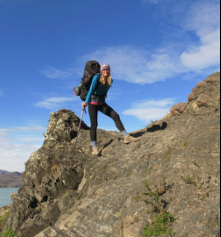 I am happy to confess I am addicted to solo travel.. I will absently feign off offers to travel with others, be deliberately ambiguous about future plans, all in genuine preference for the adventures and discovery and experiences I have on my own. Lisa gets this, and has published this awesome e-book with everything you need to know to have your own eat, pray, love adventure. Who knows? You might end up as my neighbour in Cartagena after reading it! Click on this link to grab your copy and check out some of the awesome reviews the book has received so far here.